Burrs are unwanted materials or imperfections in the parts that occur during machining processes such as engraving, welding, drilling, turning and milling. This is possible because the rotational movement of the barrels mimic that of erosion due to environmental causes and smooth surfaces in much the same way. There are numerous industrial as well as commercial applications for tumbling barrels in industries such as: retail, for the polishing of jewelry and other fine metal applications; manufacturing, for metalworking and plastic fabrication processes; construction, for the deburring of building materials, such as concrete and stone, and hardware, such as fasteners like bolts and screws; and mining, for the cleaning and polishing of stone and rock aggregates. Additional industries that utilize tumbling barrels include agriculture, electronics, semiconductor, automotive and aviation. Tumbling barrels are typically constructed from steel or a similar composite material and lined with a polymer such as urethane. A high-energy type of deburring machine, the parts or materials are inserted into the tumbling barrels which are then closed. Once closed, the barrels rotate to provide a sliding action enabling deburring to occur. Tumbling barrels are suitable for both wet and dry deburring applications; however, tumbling barrels are most often used for wet deburring. The most common application of wet deburring is for the processing of metal materials. Wet tumbling barrels require wet deburring media to function and utilize tumbling compounds that are formed by mixing liquids such as water with solid media, typically abrasive grit. 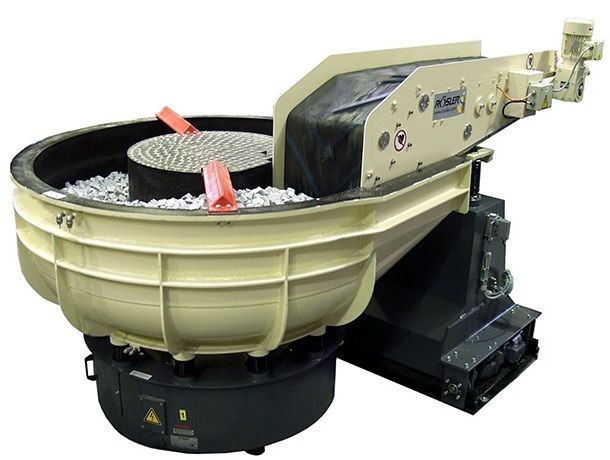 Wet tumbling barrels are often used for mass finishing applications and enhance the surface appearance and smoothness of the materials being processed. Dry tumbling barrels can utilize dry deburring media such as corn cob, stainless steel, polycarbonate and hardwood, but they do not require the use of a deburring media. Also able to handle mass finishing, which can also be referred to as batch processing, dry tumbling barrels can also deflashing and grinding. Not often used in tumbling barrels, dry tumbling typically offers a smoother finish and enhanced uniformity of the material versus comparable wet tumbling. Tumbling Barrels Tumbling barrels are a type of deburring machinery typically used on hard metals such as steel and stainless steel for the removal of heavy burrs.